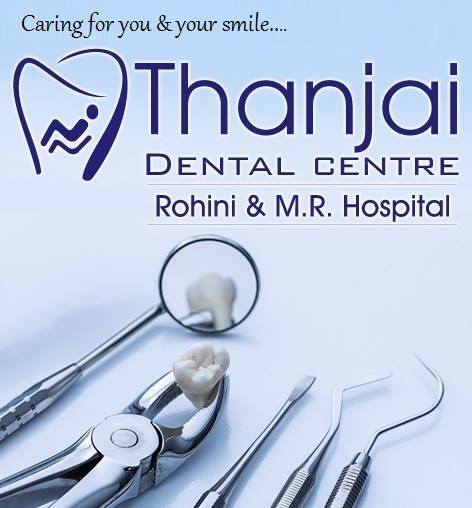 Thanjai Dental Centre is the leading multi-speciality dental and trauma care functioning in Rohini & M.R Hospitals Thanjavur. Our Thanjai Dental Centre is largest dental care centre. It is a one of a kind, modern purpose built multi-specialty centre situated in the heart of Thanjai, promoting a comfortable, relaxing but clinical environment, boasting the latest high-tech equipment. This enables us to provide highest quality care for our patients. We have all the necessary infrastructure under one roof complete with state of the art dental treatment suites, dental and maxillofacial radiology , modern integrated operating theatres and in-patient facilities. Our doctors are very highly qualified with extensive experience . Our vision is to promote dental wellness a concept which we aim to achieve through delivering high quality specialized dental care in and around Thanjavur, tamilnadu with emphasis on integrated, comprehensive and inter disciplinary approach to dental health needs. Our practice promotes comprehensive dental health plan, a plan that emphasizes not only on the dental treatment of the current dental needs but gives equal importance on prevention. We understand the unique needs of each patient, from infants to teenagers to adults to seniors. A healthy mouth and healthy body go hand in hand. Home visits on request in Thanjavur for geriatric and needed patients. We offer insurance solutions . The office is conveniently located with ambitious parking and 24/7 access to dental care via emergency service monitoring. We are the , only multi speciality hospital attached dental clinic in thanjavur. where all specialities including medical, dental, emergency, trauma care are all availabe under one roof. Maintenance and clinic management is more affordable here than in other first line cities, we are able to provide latest quality dental treatment in cost effective means. Hypertension and diabetes are very common today, we should take care of blood glucose levels and this could not be managed by dentist alone, under guidence of diabetelogist , cardiologist we take utmost care for your overall well-being. No one is completely fit today, so any medical or dental emergency during or after dental procedure can be managed more efficently so you can always be assured that your are in safe hands. Our hospital follows regular protocols in professional care in terms of sterilisation, patient management, follow up, clinic disposals etc,Regular fumigation is done weekly twice,the dental faculty is maintained like an operation theatre. Every instrument is autoclaved.You have flexibility of obtaining dental treatment as inpatient or outpatient. This is required if you need to claim for treatment as all insurance companies demand inpatient facilities along with proper records.